23 August 2012: The mayor of the Argentinean federal capital Buenos Aires represents both a sea change in the nation’s recent turbulent political history and a populist touch to the problems which have blighted the city. The conservative businessman first ran for mayor in 2003 following his stint as president of one of the country’s best-known football teams, eventually securing election to Congress in 2005 and as mayor in July 2007. He won re-election in July 2011. Born in the city of Tandil, situated in the exterior of Buenos Aires province, in 1961, Macri hails from one of Argentina’s wealthiest families. Having attended the Catholic University of Argentina, where he received a degree in civil engineering, followed by Columbia Business School and Wharton Business School in the US, Macri obtained a number of senior management positions within his father’s companies, before attaining widespread recognition as president of the Boca Juniors football team in 1995. In 2003 Macri founded the right-leaning Commitment to Change party as a vehicle for his own political ambitions, contesting the Buenos Aires mayoral election that year. In that election, Macri won the first round, taking 47% of the vote, but lost in the run-off to incumbent mayor Anibal Ibarra of the centre-left Front for a Country in Solidarity. Following the economic crises of 2001 and 2002, 2003 proved a landmark year in Argentinean politics, with the victory by default of Peronist Néstor Kirchner in the discredited presidential election of that year following frontrunner Carlos Menem’s withdrawal from the race. Kirchner had backed Peronist ally Ibarra for the mayoralty in the capital but the fall-out from the 194 deaths in the República Cromagnon nightclub fire of December 2004 led to the mayor’s impeachment following revelations concerning weak city fire inspections of the premises, Ibarra having initially blamed the federal authorities for the blaze. Ibarra was succeeded as mayor by his vice mayor, Jorge Telerman. During this period, Commitment to Change, in alliance with other parties of the Argentinean right as ‘Republican Proposal’, won several seats in the federal Congress, with Macri entering the lower chamber in 2005. Macri’s opponents charge that he has the worst attendance record in the Congress, which he does not deny but counters that the legislature “lacks debate”. In the 2007 mayoral election, Macri again took the majority of votes in the first round with 46% of the vote but faced a run-off against the government-backed candidate, education minister and socialist academic Daniel Filmus. 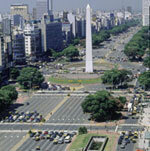 Three weeks later however, Macri secured election with 60% of the vote and took office later in the year. Macri's victory was perceived as a blow for the re-election ambitions of President Kirchner, who subsequently withdrew from the race and instead focused his energies on the foundation of a new party (the Front for Victory) to retain office for the country's Peronist wing, under his wife Senator Cristina Fernández de Kirchner's candidacy. In the election itself, Fernández came second in Buenos Aires but secured a majority across the rest of the country. During Mauricio Macri's first term, the city funded major flood prevention works, created a city police force and built 65 kilometres of bicycle paths. 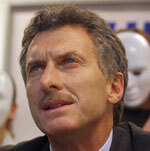 In May 2011 Macri disappointed his conservative supporters by declining to run for president. Instead he announced he would compete for a second term as mayor. In the first round of the election, Macri took 47 per cent of the vote, nearly 20 percentage points ahead of his nearest rival. In the run-off on 31 July 2011, the incumbent mayor won the support of nearly 65 per cent of voters. His opponent was Senator Daniel Filmus, a political ally of Argentina's president Fernández. In summer 2012 a stand-off between mayor and president saw the capital's subway system grind to a halt in a spat over funding which saw transport workers strike. It is thought that Macri is intending a run for president in 2015, while Fernández may seek to amend the country's term limits to allow her to run for a third term. Voters in the city of Sao Paulo could be forgiven for wondering how they ended up with Gilberto Kassab as their mayor, as they certainly didn’t elect him to the job. Having become mayor following Jose Serra’s resignation upon elevation to Sao Paulo state governorship, Kassab represents one of Brazil’s few parties of the right.